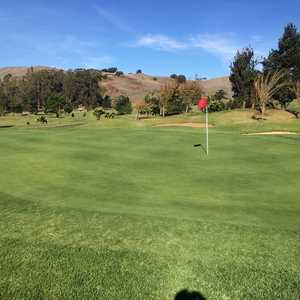 VALLEJO, Calif. - Located just minutes from Marine World off Interstate 80, this 18-hole Bent grass course (the East Course) was designed by Robert Muir Graves and built in 1994. Blue Rock also has a West Course designed by Graves that was built in the 1950s. From the blues the East Course is 6,064 yards, has a rating of 69, a slope of 122 and a par of 70. It's a tough course with water in play. It's $24 for weekday green fees and $28 for the weekend. The Blue Rock complex straddles the Columbus Parkway in Vallejo with a tunnel which goes beneath the highway for easy access to both sides. There's a suitable putting green on the west side and the driving range is on the east. Walkers are welcome and a shuttle is available. As far as amenities are concerned, the only complaints I have are that you can't drive off the grass on the range and even with all this space they won't allow you to chip or pitch anywhere. By the way, it's only a half-hour drive from the Rte 24/680 exchange in Walnut Creek to this location. The 1st hole is a 360-yard par 4 from the blues straightaway. The grass is in good shape with the fairway itself cut very close, and the rough only about one inch high. Pine trees, maples, and lindens provide a line between fairways. An octopus sandtrap guards the green on the left. The green itself is two-tiered, high on the left, low on the right with the pin in the middle. Shoot left if you want to put down to the pin, right if you like to put uphill. The 2nd hole is a 136-yard par 3 steep downhill to a broad flat green. This will be the last time anything seems at all easy on this course. The 4th hole is a slight dogleg left with birch trees lining the creekside on the right. With the variety of trees, with the green, green grasses, with the ducks and geese and other birds, with the crispness of the air...this is truly a beautiful day. 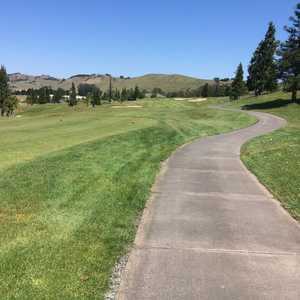 The approach to the green is uphill and if you have a tendency to hit your ball hard, you should know that there's a blind duck pond just over the lip. If you hit your ball even 10 yards too far it will go into the drink. This small lake is called Lake Kimball - dedicated in 1994 to Keith Kimball for his many contributions to golf in Vallejo. At the 5th hole, a steep uphill provides the first view of the area, with the new houses down below. Far away to the west, Mt. Diablo sits across the water. The 5th hole is the first par 5, and it enjoys a Graves favorite...a multilevel, slanted, bowl shaped green with the pin sitting pretty right in the middle. You think, ahhh, there's the pin, there's the ball...I'll just put it in. Think again. The 6th hole is a dogpatch setup from one tee green to one pin green 161 yards across at the top of the first of many hills. The 7th hole, a 523-yard par 5, is the signature hole with a sharp dogleg right. But from the tee you might be tempted to hit it directly to the pin and avoid the turn. 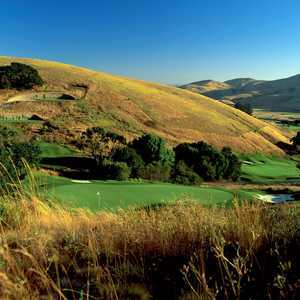 If you can hit the green 350 yards across a canyon and creek straightaway and 50 yards downhill, then go for it. If not, it still won't be easy. After you drive the first 200 or so yards to the right turn, you realize that the places a 2nd shot might land and not roll into the canyon are few and far between. You may want to lay up. Otherwise there's a narrow green along the levee next to the road which you might be able to stay on. As you get closer to the green there are a variety of sandtraps on the slope to foil you. Make a mistake and you can scare up a flock of mallards off the water...as I did. The 10th hole is a par 4, 346 with a downhill to water on the right. The pin is well protected by bunkers, sandtraps, and a drop-off on the right. The 14th hole is a 551-yard par 5 with most of it blind to the green. It's deceptive because there are two flags, and the first one you see on the right at about 180 yards out is the wrong one. The pin, which was hidden until you got to the top of the second rise, is down to the left. The 16th hole is a 159-yard par 3 with a gully between the tee and the green. Having reached almost above the timber line, a large rock formation comes into play surrounding the green. The 17th hole is designed, amazingly enough, around the green on the 2nd hole. A dogleg right from the top of the hill, you can see down to both your green and the green for the 2nd which lays in between. One of my playing buddies sliced his shot onto the wrong green and although it worked out ok for him, I wouldn't recommend it. From the top of this hill at the tee of the 17th hole the red sun begins to set behind Mt. Diablo across Carquinez Strait. There appears to be a new housing development closing in on the hillside that serves as the background for this beautiful setting, but instead it's a sand and gravel company digging out its product. With its interesting idiosyncrasies, the East Course at Blue Rock Springs is another great one by Graves. The pro is Tom Wade. For tee times, call after 6 a.m., five days in advance.